US, 1995, 140 minutes, Colour. Tom Hanks, Kevin Bacon, Bill Paxton, Gary Sinise, Kathleen Quinlan, Ed Harris, Loren Dean, Ray Mc Kinnon. American audiences applauded this film. The “two thumbs up” reviewers, Siskel and Ebert, were interviewed and noted that it was the first American film in a long time that did not show the lone hero solving every problem, but showed Americans collaborating in a crisis. They are right and this is one of the strengths of this re-creation of the potential disaster in 1970 when the shuttle to the moon lost oxygen and it was a struggle to bring the vehicle and group back to earth. Against all odds, they did. Audiences who enjoy the technical and the technological will be enthralled by this film. Those who are not, if they are patient, will find that they are caught up in the crisis, the way the astronauts handle situations and how Huston uses its scientific ingenuity to work out ways to get the extra energy that will save the mission. The cast is solid, the expedition led by Tom Hanks who reminds us that he can be an intelligent American as well as a Forrest Gump. Ed Harris at Houston and Gary Sinese as the astronaut whose voyage was cancelled because of suspected measles but who helps them down, stand out. Another fine example of director, Ron Howard’s skill in popular movie storytelling. 1. A film based on actual events? Historical? 25 years after the events? A film of failure and success, consequences? 2. Ron Howard, his career, capacity for storytelling? 3. 1969-1970, the walk on the moon, the response of the public, the subsequent missions, the lessening of interest by the public, by the television channels? The musical score? 4. The introduction about the space race, the USSR, the U.S., Walking in space, travel to the moon? 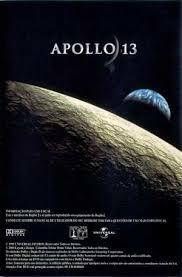 Apollo 13, the plans and hopes? 5. The introduction to the crew, Jim Lovell and his leadership, his personality? Tom Hanks in the role, his image on screen at the time, Oscars? Lovell and his wife, the family? Working as a guide, the call, the promotion? Preparation for the flight? His son going to college? His wife and her not wanting to come to the launch, her change of mind? Ken, his expertise, health, measles, his being excluded? Fred, jokes, his family? Jack, girlfriends, the media interest in him? The scenes at home and the good spirits amongst the men and families? 6. The tests, the equipment, the role of the computers, the plans, communications? 7. The blast off, Lovell’s wife, the joy of the success, the team at Houston, the families? 8. Ordinary life on board, people asking questions, food, urinating, working? 9. Houston, Gene Krantz, his role in control, all the teamwork, the scientific observations, communications with Apollo 13? 10. The explosion, the situation, Houston and the team trying to work out what happened? The astronauts, the flight, their coping? Intelligence and wit? 11. The difficulties, the dangers, the lowering of the oxygen, the pressures, the physical and mental condition, the cold, feeling worse in, clashes in blame, Lovell and his control, talking with Houston, following directions, the health measures? 12. The difficulties, the experts and Houston, Ken and his being awakened, coming, going to the simulator, tests and hypotheses, the various theories, the amps, the success? 13. On the ground, the families, Lovell’s wife and her presence, her son at school? 14. Going through the barriers, the heat, the long silence? Joy at contact again? 15. Ultimate success, the helicopter, the rescue? 16. The end, the information about each of the men? Their subsequent careers? Lovell and his writing of this experience?